Saxony (Sachsen) is 7,110 mi² (18,416 km²) in size with a population of 4,226,000 and has a long history as a duchy, an electorate of the Holy Roman Empire (the Electorate of Saxony), and eventually as a kingdom (the Kingdom of Saxony.) In 1918, after Germany's defeat in World War I, its monarchy was overthrown and a republican form of government was established under its current name. 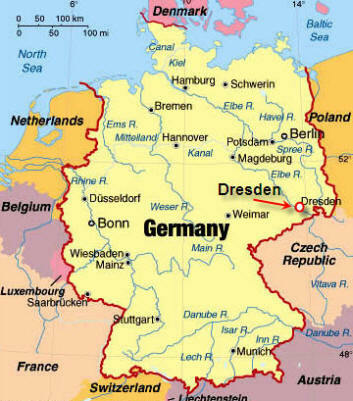 The state was broken up into smaller units by the German Democratic Republic (GDR) during communist rule (1949-89,) but was re-established on October 3, 1990 in the re-unification of East and West Germany. 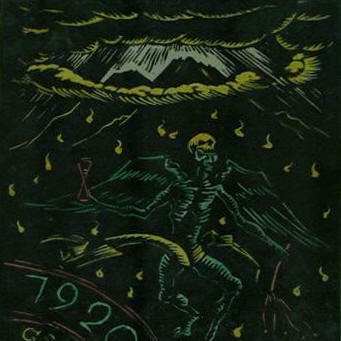 Its flag is above left and coat of arms above right. 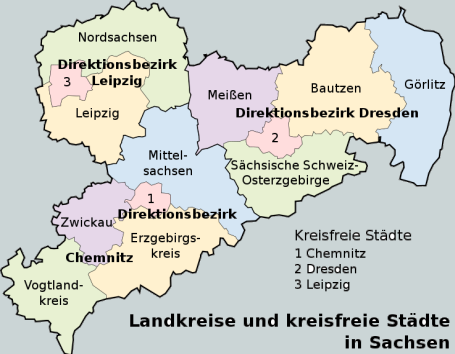 Sachsen (the green in the Germany map, below left) is divided into three Direktionsbezirke — Chemnitz (1,) Dresden (2) and Leipzig (3) — which are again subdivided into a total of 10 subdistricts. 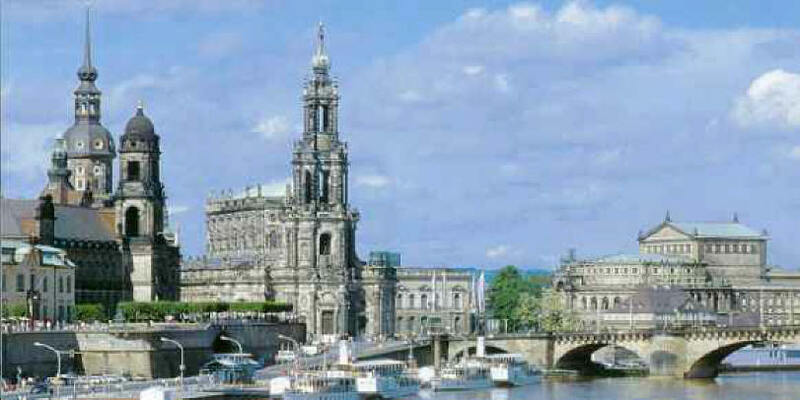 Dresden is the capital of Saxony. 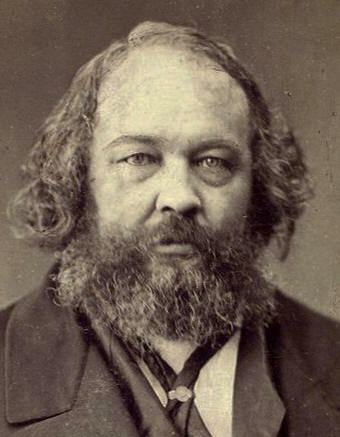 During the 1848–49 constitutionalist revolutions in Germany, Saxony became a hotbed for revolutionaries, with anarchists such as Mikhail Bakunin (Russian anarchist, left) and democrats including Richard Wagner (see Diario #9) and the famous architect Gottfried Semper (right, see later) taking part in the May Uprising in Dresden in 1849. The city of Chemnitz (left, coat of arms) is named after the Chemnitz River, a small tributary of the Zwickauer Mulde. 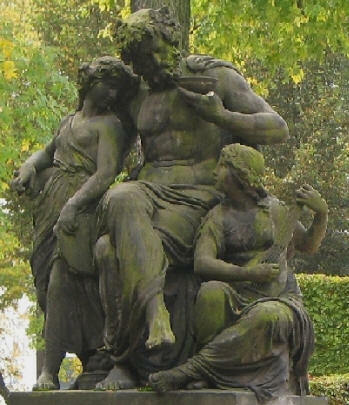 The word "Chemnitz" is derived from the Sorbian language and means "stony brook" (Kamjenica.) 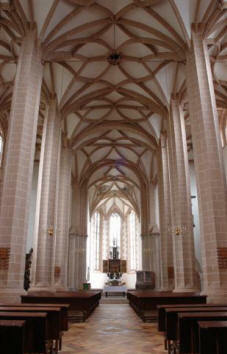 Its size is 85 mi² (221 km²) with a population 246,110 and is the 3rd largest city in the Free State of Saxony. Located in the northern foothills of the Ore Mountains, it is a part of the Saxon triangle metropolitan area comprising 3.5 million people. The city's economy is based on the service sector and manufacturing industry. 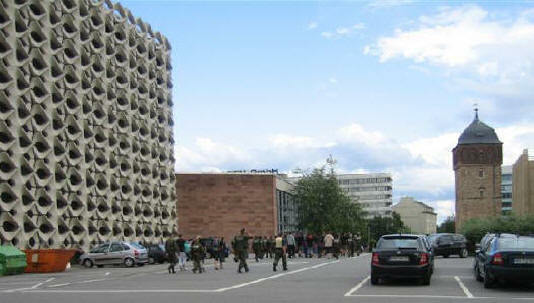 The Chemnitz University of Technology has around 10,000 students and is the scientific center. An early Slavic tribe's settlement was located at Kamjenica, and the first documented use of the name Chemnitz was at the 1143 site of a Benedictine monastery, around which a settlement grew. Circa 1170, Frederick I Barbarossa, Holy Roman Emperor, granted it the rights of an imperial city. 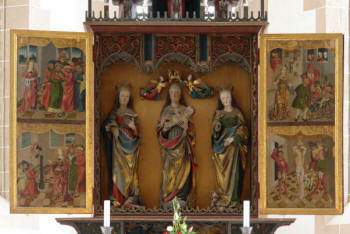 In 1307, the town came under the rule of the Margrave of Meissen (the predecessor of the Saxon state). In medieval times Chemnitz became a center of textile production and trade; more than one third of the population worked in it. 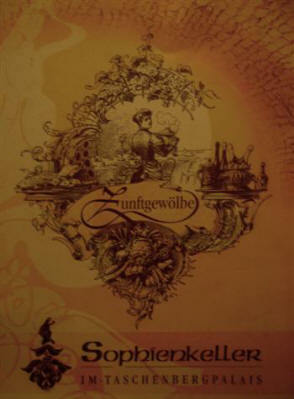 By the early 19th century Chemnitz had become an industrial center (sometimes called "the Saxon Manchester.") 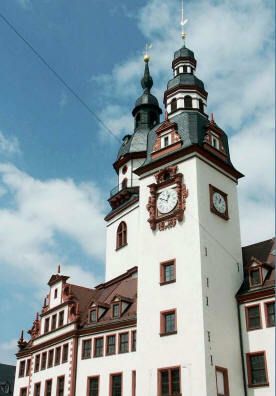 In 1913 it had a population of 320,000 and is one of very few German cities which were larger then than they are today. Akron, OH is its sister city. During WW II, Chemnitz (aerial map of the city, left) had factories that produced military goods and a Flossenbürg forced labor subcamp (500 female inmates) working for the company Astra-Werke AG. The oil refinery was a bombing target of the Oil Campaign of World War II, as well as Operation Thunderclap attacks. These bombings left most of the city in ruin, and post-war, the GDR reconstruction included communist large low rise (and later high-rise plattenbau) housing. Some tourist sites were reconstructed during the the GDR era and after German reunification. From 1953 to June 1990, Chemnitz was named Karl-Marx-Stadt (Karl Marx City). In 2006 the BBC reported that Chemnitz had the lowest birth rate in the world. The local and regional economy is based on medium-sized companies with heavy industry including mechanical engineering, metal processing and vehicle manufacturing. 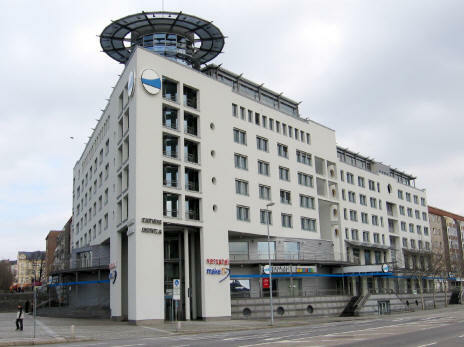 Today Chemnitz is among the top ten German cities with the highest growth rates. Katarina Witt (above right) Olympic gold skater in 1984 and 1988 is an honorary citizen of the city because she attended a special GDR sports school for talented children named Kinder und Jugendsportschule in Karl-Marx-Stadt. Another sight is the red tower which was built in the late 12th or early 13th century as part of the city wall. 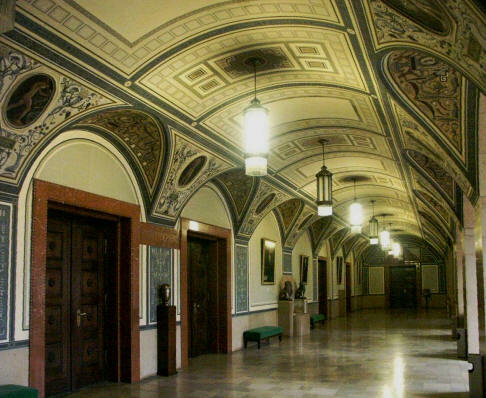 Below are stock photos of the Altes Rathaus (old city hall) and its interior design. I woke at 8 AM and went back to sleep at 9:30 and woke again at 11:30 and then got up. I immediately went and took some photos out the window since we were so far up. These give you an overall view of this recovering old German city. Look very carefully at the photo above and you get a hint of a tiny memorial statue in front of the long white building - I zoomed in and got this shot below. Can you guess what it is? More about that later. I was impressed with the very modern Otis elevators in the building and I had used them to go to the 21st floor to get some of the photos above. From the date it seems the Accor refurbishing must have been in 1995. This porcelain piece of art in the hallway was quite interesting. I was out the door and on my run by 1:30 PM and headed straight for the park and the lake. I crossed this little muddy brook on the way there. ... and then I came across what appeared to be an old monastery. From the maps below, you can see the lake and Schloss in the upper left (below left) and how far from the Mercure Hotel it is. 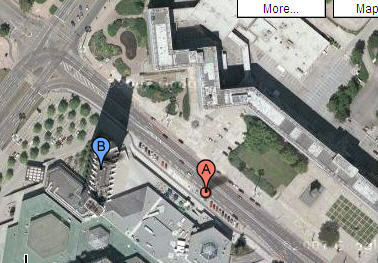 The maps below give you an overview of the downtown are. 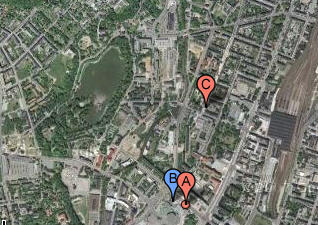 The map on the left shows our hotel (A) and how far it is to get to the lake. The center map shows the Schlossberg complex just below the lake and the map on the left shows the whole lake which I ran around it. As I ran on the path around the lake, I stopped and took a shot of both coming and going. It was a very nice place to run. As I got closer to the lake, there were benches for people to sit and look out and I got this shot looking back at our hotel. I love weeping willow trees dipping their leaves in the lake. ... and here is the patio area where I sat outside. 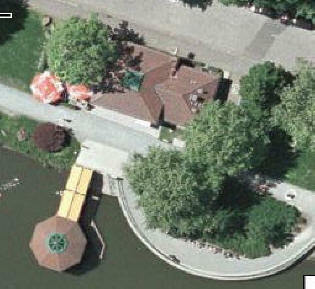 Below right is a stock aerial photo of the complex. Here is a stock photo of how it looks in the winter. 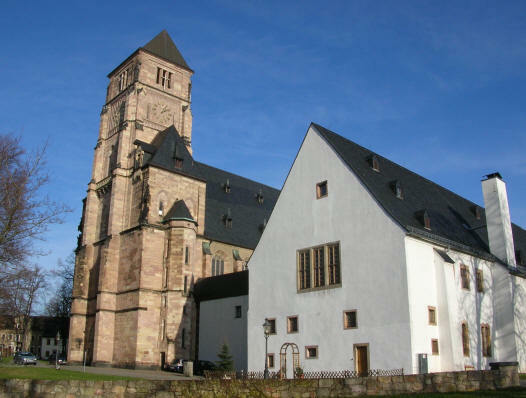 I was now in the section called Schlosschemnitz (yellow section in map of the city divisions) and headed for the castle and church which is now a museum. On the way I spotted this little theater site in the park. 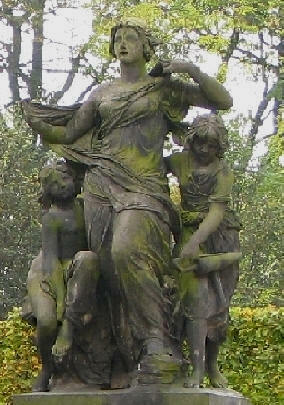 There were also several monuments and statues in the gardens of the Schloss. 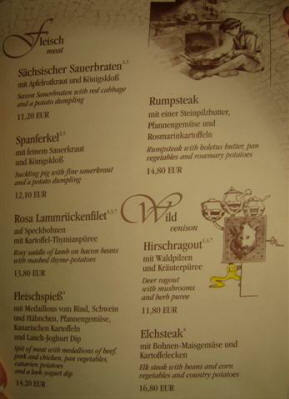 I had to go up the hill to tour the Schlossberg Museum (Schloßberg 12, +49-371-488-4501.) 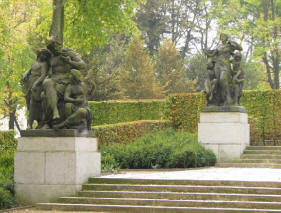 After climbing several sets of stairs I came across this statuary entitled "Abend" (Evening) left and "Morgan" (Morning) right. Above right is my photo of the Schlosskirke and below is a stock photo. The church (kirke) is on the left and the white building holds the large museum. 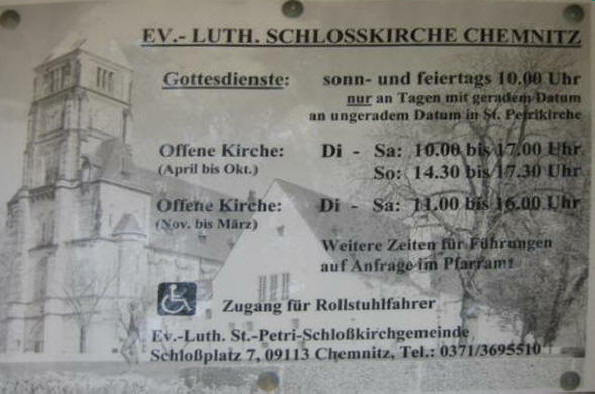 This is an active Evangical-Luthern Church which holds services. Below are small shots of the church's north portal, its interior, a painted sculpture of Christ's scourging and the church alter. Because the intricate detail is so interesting I am doing something for the first time: reproducing them below in larger scale though it requires scrolling up an down. The museum was full of an eclectic series of displays. 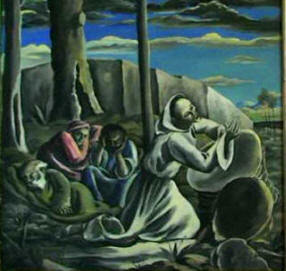 Below left is "The Garden of Gethsemane" by Gustav Schaffer from 1920 along with painting "Iltzstadt bei Passau" from 1930. There were a whole series of complex models of the city during different periods. You can see the stages in the photos below. Below is a photo of the fire in the Chemnitz main Synagogue during Kristalnacht in 1938. Below they had interesting aerial photos of the central city before and after it was heavily bombed during WW II. As I said, their displays were eclectic. After a nice discussion with one of the museum attendants, at 3:10 I left the museum and walked back to the hotel and on the way I came across this charming little restaurant with outdoor dining. As I approached the Mercure Hotel, it kept getting bigger. I enjoyed taking pictures of it. It towers above everything in the city. As I got near the hotel, I took some photos of the huge statue I pointed out earlier. It is the Karl Marx Monument, the city's former communist namesake. I have to admit, this thing was pretty impressive. The artist Lev Kerbel sure made him very stern. I wonder why it is still sitting here; too heavy to move? I took some photos of the little bar in the hotel that we went to last night called HoRcH's. As with the rest of the hotel, its theme is automobiles. I went to our room and packed and then at 4 PM we checked out of the hotel. I bought a Mercure hair brush for €6 because they are the absolute best. We decided to drive over to the shopping area and found a spot in their nearby lot. We walked awhile and looked around and at 4:30 we sat down for lunch at a little place called Allegretto [Innere Klosterstrasse 11, +49-371-494-8461.] 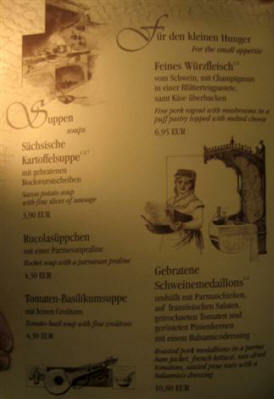 Marcia had a bocadillo (Kochschinke with gouda tomat = ham with tomato and gouda cheese) and I had another cappuccino. We walked around the large shopping area for awhile. They really must have renovated this area a lot and maintained some of the old historic buildings. I can't help photographing the Gutefahrt (goo-teh-fart) signs meaning "Have a good trip.") The series of penguins was kind of cute (below left.) As I looked back at the area (below right) you can see they still have more work to do. By 5:40 we said good-bye to Chemnitz and were on the road but stopped to get gas at AGIP and this time it was $6.13/gal. 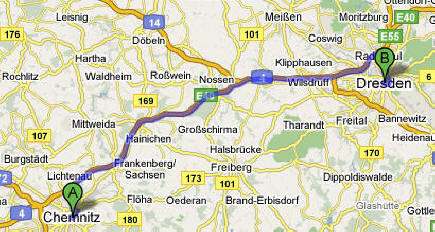 Marcia then drove the 78 miles on the A-4 Autobahn northeast to the great old city of Dresden. 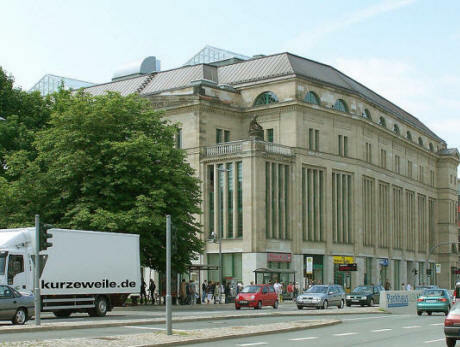 We soon arrived in downtown Dresden. What an interesting city. In laying out our plans, I thought it would be important to spend two nights in both Dresden and Leipzig, both historically important cities that got stuck in East Germany for decades. Here are some shots I took crossing the bridge over the Elbe River on the way to our hotel. 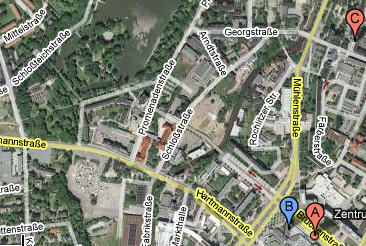 At 7 PM we found the place and checked into the Mercure Newa (Rm #1418) [St. Petersburgerstraße, +49-351-48140] (below left.) Since we will be here two nights, this was a time for a nice hotel. We are really deep inside the old East Germany now. I used one of their carts to take the bags up. The key they gave us was one I have never seen before. Its just a little round metal thing (below right) that you just place over a recess in the door and it opens it. We were pretty high up on the 14th floor so I took these shots from our window out the back of the hotel. There is a train station to the right. 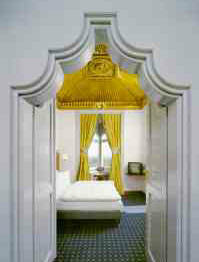 As you can see the hotel has had a very nice refurbishment by Accor. I had to take this photo of the sign for my daughter Kristin. A colleague from Berlin (Dr. Manfred Tetz) had told me to visit some beautiful places to stay when in Dresden, so we wanted to go take a look at them. We got unpacked and at 7:45 we headed out. We drove to Romantik Hotel Pattis [Merbitzerstraße 53, +49-351-4-2550,] but this was not the right place that Dr. Tetz had spoken about. 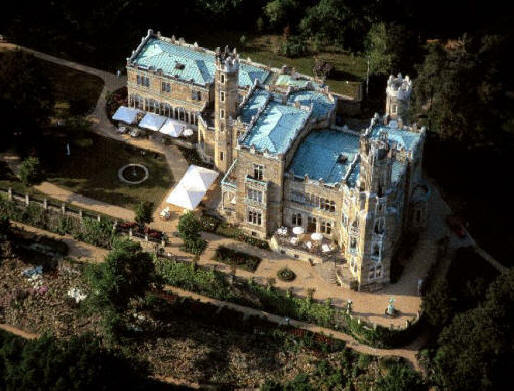 It really looked like a wonderful place to stay but costly. So at 8:15 I drove the 7 miles to Eckberg. At 8:30 we arrived at this wonderful place up on a hill overlooking the Elbe called Schloss Eckberg [Bautzner Straße 134, +49-351-8-0990.] We parked illegally in the vendors alley (below left) and wended our way to the building and after looking around, we sat in their outdoor patio dining area and had a Radesberger pils from the tap and wine in this beautiful setting. It wasn't cheap at $16. 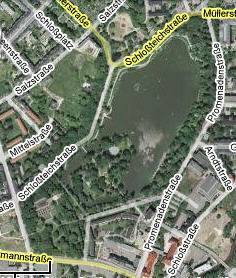 Below is an aerial shot of the place and a map showing its position in Dresden. 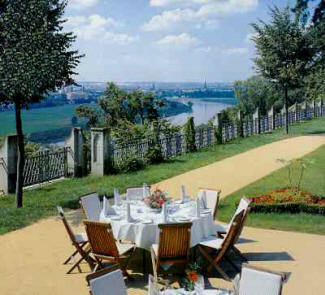 Below are some of their stock photos of the patio dining area where we sat and the back side of the palace. Below are their shots of the beautiful grounds. Isn't this beautiful? I really thank Manfred Tetz for recommending us to see it. 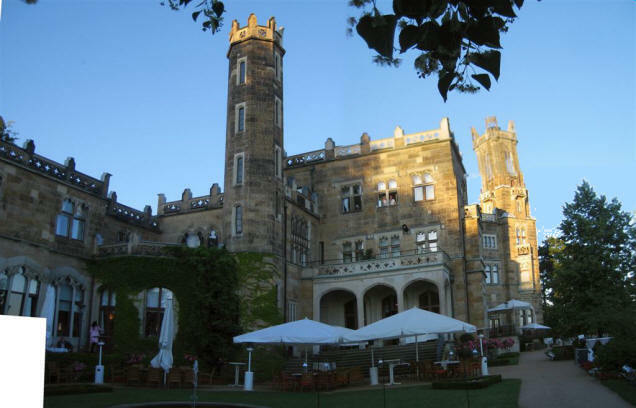 The Schloss was built by the wholesale merchant Johann Suchay, in the Tudor style between 1859-61 using the Dresden architect Christian Friedrich Arnold. 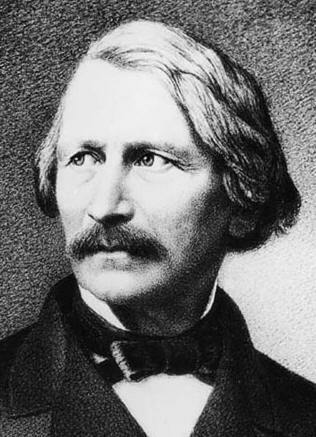 Arnold was one of the most prominent followers of Gottfried Semper, the creator of Dresden's opera house (see later,) known today as the Semper Opera House. 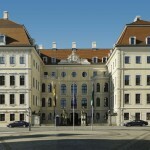 The Munich Argenta group acquired this palce in 1994 and had the buildings and gardens thoroughly renovated and redesigned as a luxury hotel to plans by the Italian designer Danilo Silvestrin. The dining rooms (above right) are quite splendid. 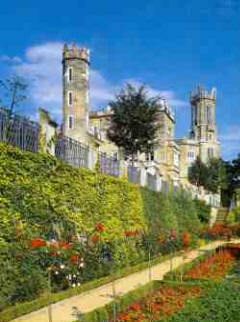 To stay in a room in the castle (left,) it will cost €235 ($320) a night. A little much for us. They have a side building that is a little cheaper. Again it was impossible to get the whole palace in in one shot so I PhotoStitched this one from four pictures taken way at the corner of the patio. You can see the steeple on the right got a little tilted. It was beginning to get dark, so I hurried to get some pictures. Marcia was really enjoying this place and I think she looks very cute in this shot. Here are some of the panoramas I took looking out across the Elbe. We relaxed for an hour enjoying the ambience and the views and on the way down the hill (above right,) it was obvious our timing was spot on; the traffic uphill was at a standstill. We then left at 9:30 to find the Taschenbergerpalais Kempinski Hotel [Taschenberger 3, +49-351-49-7260] which is in the center of the city. 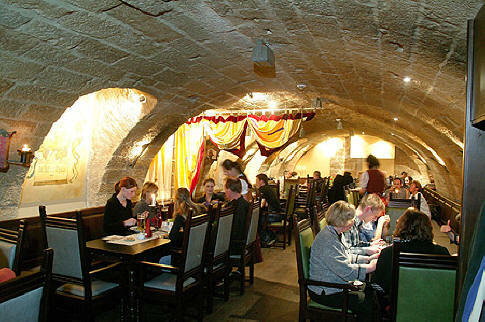 We are going for dinner at Sophienkeller Zunftgewölbe (old celler) which is in the Taschenbergerpalais. Its position in the palace is shown in the plan left in orange. After we were given a table and I ordered the wine, I just had to go explore it all and take some pictures. It seemed to just go on and on. Below left is one main central dining area with balcony seating. The wood carvings on the balcony were quite intricate. Below is the view from the balcony. 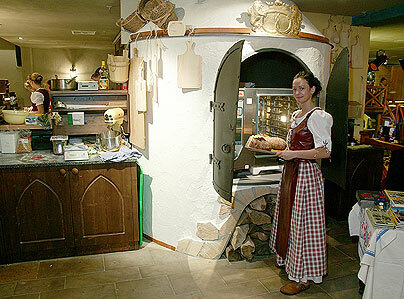 I wended my way through what appeared to be a cooking area with this large oven and a spit with a whole pig roasting. 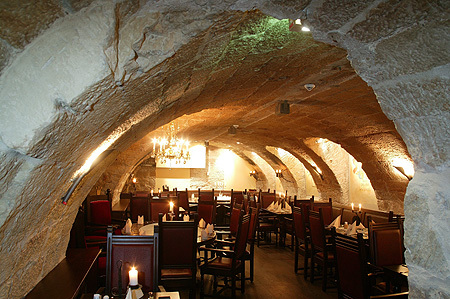 Around another corner was another dining area and the next room had this table made from old torture chamber remain. See the hand cuffs at the far end and the gear handles for a rack on the near end. There were all sorts of medieval torture instruments on the walls. 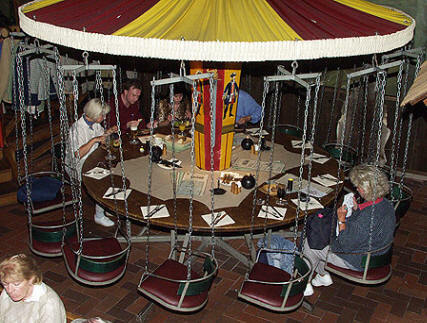 Then I found this one cubbyhole with a table and large circular bench for a large party. Below left is a small Ferris wheel seating. Amazing. I got back to Marcia who was relaxing and enjoying the ambience of this special place. I got back to the table and tried some of the wine I had ordered. It was good. It was a bottle of Jan Ulrich 2006 Goldriesling trocken (dry) wine (from Diesbar-Seusslitz, www.weingut-jan-ulrich.de) and we also had ordered a bottle of Margon sparkling (= mit Kohlensauer versetzt) water as we looked over their menu. All Marcia had was Fleischspieß vom Rind, Schwein und Hähnchen (kebob with beef, pork and chicken,) Pfannengemüse (green beans,) Karnarischen Kartoffeln (little roasted potatoes) und Lauch-Joghurt Dip (yogurt dip.) She loved it. For dessert Marcia had Eis (ice cream) and I had an apple strudel. During and after dinner we were entertained by this very charming gentlemen, decked out in Saxon clothing, who just keeps telling stories. His English was excellent and he was very funny as you can see by the expression on Marcia's face. We had a great time. Here are some of their stock photos of the Sophienkeller. What a wonderful night. When we were finished at 11:35, Marcia drove us back to the hotel and we enjoyed a beer and an Amaretto at the Mercure Hotel Bar and then I got online for free in their business office and did AOL email. I went to bed at 3:30 AM.